Tag line: "There are ghosts walking among us, looking for help... They have found it"
After he and his wife Anna (Olivia Williams) return home from a night out, Child psychologist Malcolm Crowe (Bruce Willis) is attacked in his bedroom by former patient Vincent Gray (Donnie Wahlberg), who suffers from a complex disorder Crowe was unable to treat during their sessions together. One year later, with Vincent still fresh in his mind, Crowe begins counseling a young boy named Cole (Haley Jole Osment), whose symptoms are similar to those that plagued Vincent, and though his dedication to Cole is causing his marriage to fall apart, Crowe won’t allow himself to turn his back on another patient. Yet he starts to wonder if he’s in over his head when Cole finally reveals the nature of his unusual problem: he sees ghosts everywhere, some of whom even talk to him! Director M. Night Shyamalan manages to generate a great deal of tension in The Sixth Sense by letting us see what many of his other characters can't, namely the spirits that haunt Cole on a regular basis. One night, during a trip to the bathroom, Cole notices a light on in the kitchen. Assuming it’s his mother, he walks down the hallway to investigate, and finds himself confronted by the ghost of a woman (Janis Dardaris) who'd taken her own life. She shouts at Cole, and shows him her mangled, bloodied wrists, sending the terrified boy scrambling back to his room for safety. By revealing to his audience the nightmare Cole is dealing with, which not even his mother (played so well by Toni Collette) understands, Shyamalan brings us inside Cole's world of isolation and despair. The only person he can confide in is Dr. Crowe, who he hopes will somehow make these apparitions go away. As was the case with Vincent, Crowe is at a loss, but this time, he's going to stick it out. Perhaps he'll help the boy break free of the curse that's haunting him. Maybe, with Crowe's assistance, Cole might even discover it isn’t a “curse” after all. 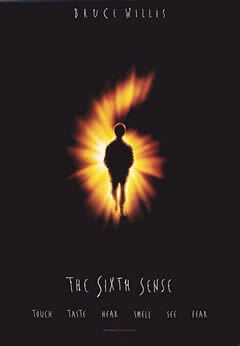 Initially, I felt a bit short-changed by The Sixth Sense. With a topic as potentially limitless as communicating with the dead, the film could have easily veered off into many different, fascinating directions, and I found myself wishing it took the time to explore its own reality a little more closely. But much like his later works (including Unbreakable and Signs), Shyamalan uses the grand scope of his subject matter to relate a single tale, never once stretching beyond its borders. I soon realized this is what made The Sixth Sense such an engaging motion picture, and despite all the discussion and analysis dedicated to its twist ending (which, admittedly, caught me off-guard when I first saw the movie), it was the story of a troubled young boy, and the doctor trying to help him, that impressed me most. It was a long time ago when I saw this film, and the ending caught me off guard. I suppose by criticism of the flick would come from it being a bit too slow. By the way, I am watching "Boiler Room" tonight as I have never seen it. I am looking forward to it. The problem with this film is that it's rewatchable once. The first time you see it, the twist is shocking and awesome. The second time you see it, you see all of the foreshadowing of that twist. And then there's not much here. I really prefer Stir of Echoes. I agree, the point is the movie as a whole, not the "twist ending." I knew the ending going in (I put together hints from different reviewers until I saw that it was the only possible answer), but it didn't affect my enjoyment of the film at all. Sorry, guys! Not sure how I missed replying on this one. But I definitely appreciate the comments. Jeremy: Some may find it slow, but I was definitely into the movie. Let me know how you liked BOILER ROOM! I haven't seen it in a while, but I remember enjoying it (even though Ben Affleck's scenes felt a bit too "tacked on", and entirely unnecessary). SJHoneywell: I still enjoy the movie on rewatch, mostly for the reasons stated above (the relationship between Cole and the Dr.). But I will agree that STIR OF ECHOES is a solid ghost movie, and one I definitely enjoyed. Thanks for posting the link. as always, a great write-up!